The Audio DSP24 Value sound card from the Hoontech company was reviewed by us some time ago. The card left quite pleasant impression. It had a low price, high-quality converters and multi-client support. With a minimal set of accessories a year ago it was the cheapest professional sound card on the market. Another interesting and intriguing product from the same manufacturer is Audio DSP24 MKII which comes next in the professional line after the DSP24 Value. 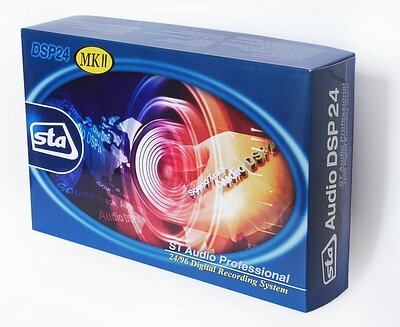 The MKII is an advanced version of the successful DSP24 Value, which attracts more attention. Today we will find out what is better or worse in the more expensive solution. 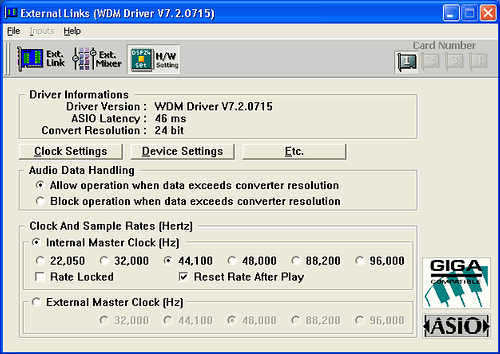 In comparison with DSP24 Value, the first thing that changed is outputs. RCA on the linear inputs/outputs is replaced with XLR (also known as Canon). 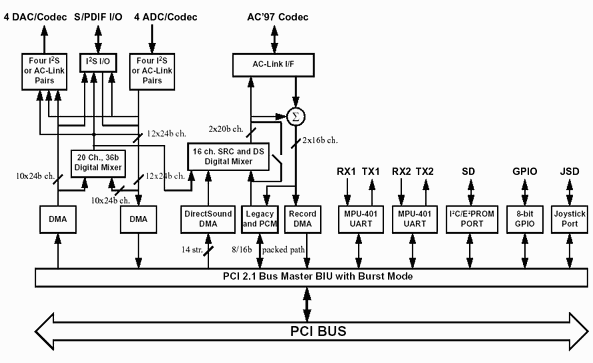 To extend capabilities of the card one can use the H-BUS connector. 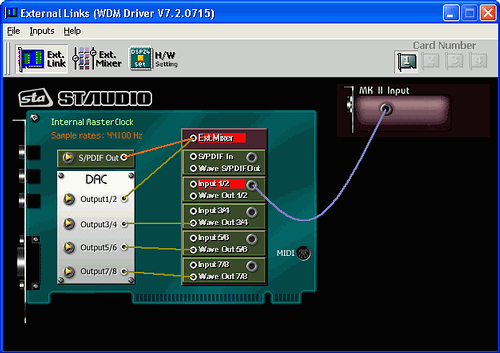 The MIDI interface on the daughter card is changed for the AES/EBU digital interface. The card also has 8 independent outputs. As the connectors are a bit unordinary we will test one more interesting device from Hoontech which is a 6Ch Digital Amplifier. This device connects to the tested card via the H-BUS. As you can see, instead of gold-plated RCA connectors present on the Audio DSP24 Value this one has 44-pin H-BUS and 15-pin D-SUB ones. The latter has a special adapter which has two balanced outputs/inputs (XLR) from the professional I2S codec and an output from the AC'97 codec (minijack). I must say that the adapter for XLR connectors is not the best engineering solution in this case. 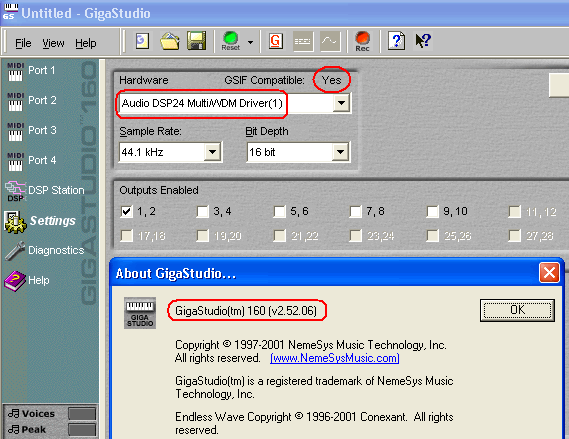 First of all, the interface is not widely used in inexpansive audio equipment (linear stereo inputs of mixer consoles). Also balanced connection is not needed much in PC based studio where we can short connections. 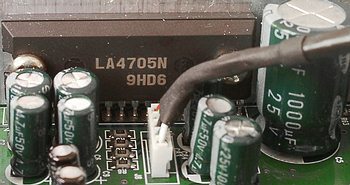 Secondly, the thin wires and too closely positioned conductors in the connector favor additional crosstalk noises. AC'97 stereo codec SigmaTel STAC9721T. The chip and the codec are identical on the Audio DSP24 MKII and Audio DSP24 Value cards - ENVY24. Here is the block diagram. In the Hoontech Audio DSP24 Value Sound Card Review the design and capabilities of this chip have a clear comprehensible description. The daughter card is also strange. Unlike DSP24Value it doesn't have MIDI interfaces! It means that it's impossible to connect a MIDI keyboard, which is crucial for music composing in home/project studios. By the way, for this card there is an external devices with MIDI interfaces, but of cource everything is sold separatelly. The connectors you can see on the photo are digital outputs/inputs: S/PDIF coax, optical and professional 3-pin digital AES/EBU interface. 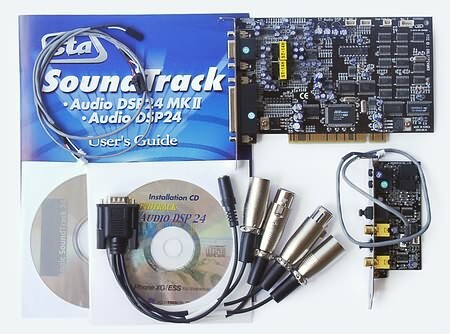 I also suppose that DSP24 MKII is not the card which will a heart of $50000 PC studio with AES3 interfaces. The user's guide is made as a small booklet. Written in English, it includes pictures with detailed description of the card's capabilities and a driver installation order. 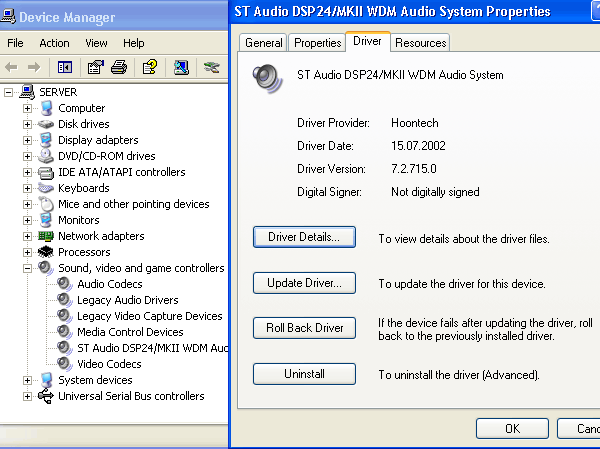 Between the review was finished and it was published Hoontech announced new full redisigned driver version for W2K/XP. Before that ther was not any drivers from 2001 Fall. So, we just updating out review (old version is here now). 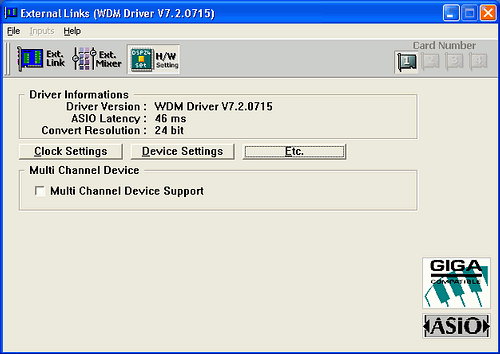 We have tested the card with new WDM-drivers/utilites of 7.2.0715 version. As with VxD-driver all was ok, so we have tested it only with Windows XP. The installation of the drivers was flawless. After that a great heap of sound devices appeared in the audio properties tab. 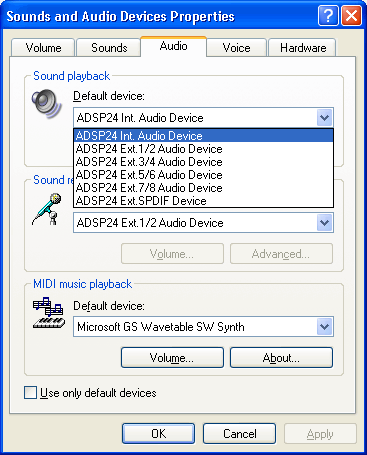 Int.WaveOut supports DirectSound and controls sound in OS and games. It means just limited support for simple Windows applications. 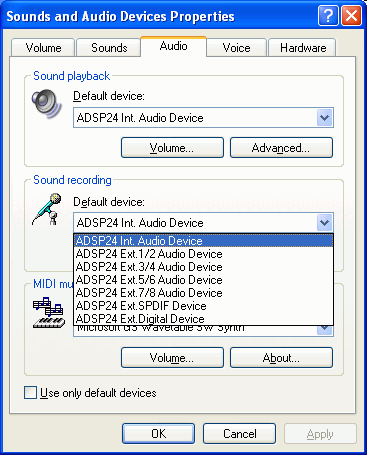 DSP24 MKII doesn't provide hardware DirectSound/DirectSound3D/3D positional API support (it ever has no any secondary hardware buffers). That is why if you need good sound in games you should get a multimedia card (may be as additional to a professional card). Ext. WaveOut 1/2...7/8 - 4 separate stereo devices allow for simultaneous operation of several audio applications under different interfaces. S/PDIF Out is a digital output for the daughter card we mentioned above. Multiple PCM Out is one more device working as the Ext. WaveOut. 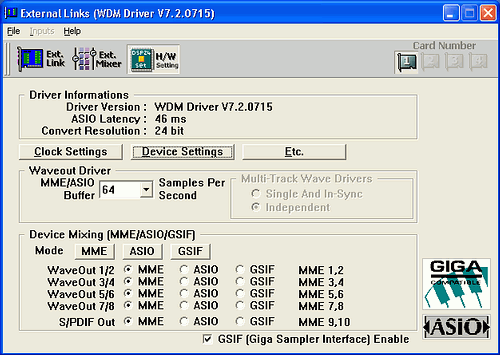 It is used in multichannel MME applications (Cakewalk Sonar, Samplitude Producer). There are a lot of recording devices as well. 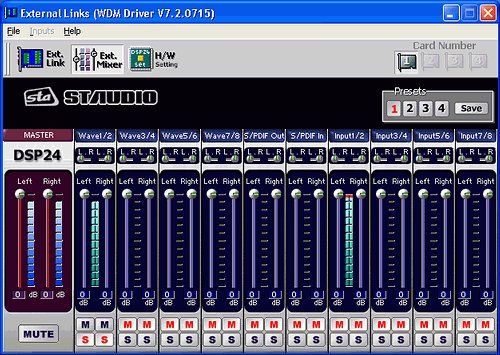 The Digital Mixer serves for recording MIDI into audio tracks in various sequencers. 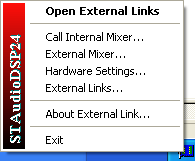 In updated utilites all options concentrate in one place - universal control panel named External Links. As we can see, all multiclient settings are enabled now. We used licenced copy of 2.50 (specially taking for the testing from friendly recording studio) with latest 2.52.06 patch from Nemesys site. GigaStudio works flawlessly, the driver is recognized well. There are 3 sampling rates (44.1, 48 and 96 kHz) and 2 kind of bits (16 and 24). 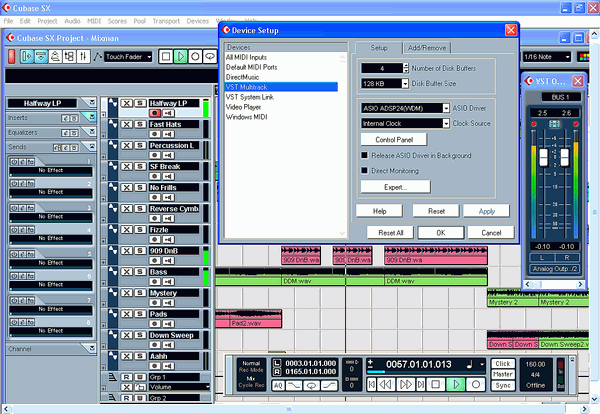 With newest ASIO-based professional audio/MIDI-sequencer Cubase SX the card also works fine. So, with updated drivers for W2K/XP, the card takes full ability for professional using. But what about its sound quality? The test compositions were played on the Event 20/20 bas studio monitors. For estimation of the DSP24 MKII sound card we compared it with the sound produced by the professional ESI Waveterminal 2496 model. The comparison was carried out in a real time mode by reswitching between simultaneously working CoolEdit Pro 1.2a programs. On the whole, the DSP24 MKII card plays not bad, but when compared with the Waveterminal 2496, the difference is noticeable. Especially it concerns sound details. The test compositions sound less discernible on the MKII, probably because of a noticeable distortion level in the high-frequency range. The sound of cymbals and hi-hat is not very clear, there are some additional sounds and wheeze. Besides, the MKII delivers timbres of the instruments a bit incorrectly, contrary to the Waveterminal. Well, the card suits for music listening, but not for sound processing in professional musical applications. Certainly, the multiple circuits and minor components do affect sound quality. Crosstalk (interference) also has an effect on sound to some degree. Unfortunately, there is only a bunch of very thin cables for outputs of the professional XLR format. Now let's turn to the objective tests which are also very interesting. The objective tests of the card were carried out with the RMAA 4.0 beta. For better undestanding what the numbers mean, we recommend to read a special document - RMAA soundtest explanation. The frequency response is vague. The noises and distortions are also unacceptable for professional usage. The card has disappointed us. The characteristics are worse than those of the cheaper junior DSP24 Value. It turned out that the RMAA program is necessary exactly for such cases when a card looks professional, but shows quite strange results. The sound it produces doesn't impress us as well. The 6-channel amplifier comes with a special cable for connection to the sound card. It is about 1 m long which doesn't allow us to choose any place we'd like for it. The amplifier is designed to suit a rack mount. That is why it has no legs to be placed on a desk. However, the front panel of the amplification unit is only 16.5 (!) cm, that is why it is very close in dimensions to a CD-ROM drive. The front panel has volume controls separately for four channels, headphones, buttons of amplifier power and amplified signal application to the outputs. Everything is simple and clear. On the back panel we have Line and 6-channel outputs, a sound card connector and a power-in. Power comes from a 12V bus of a computer's power unit via an adapter. This nice white box has 24/96 DACs AK4393VF from AKM inside (Hoontech never had problems here). 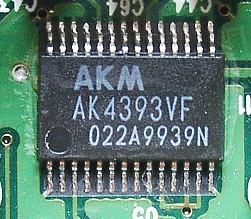 The manufacturer uses three identical 2-channel LA4705N chips for amplification. Taking into account that the 6Ch Digital Amplifier receives power from the computer's circuit (12 V), the amplifier is not used with passive acoustic systems. Although the user's guide shows some pictures of passive multimedia acoustic models which are produced by Hoontech specially for this purpose, the given system has nothing in common with professional usage (plastic cabinets, small dimensions, you know). With such speakers it's difficult to tell one card from another (even a $200 card from a $20 one). 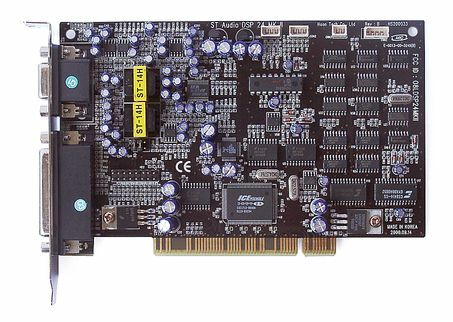 In general, this professional Audio DSP24 MKII card doesn't make an impression with its sound quality. If Hoontech corrected this problem, possible it will be a good card. But now it seems that the junior Audio DSP24 Value with SPDIF/MIDI bracket may stimulate much more interest. results of the measurements are not so good for such pretentious professional card.